As unrest swept across 20th-century Europe, Asia and Latin America, a new political party born out of those conditions took hold in dozens of countries, upending political and social norms. Economic collapse, war and political upheaval paved the way for the rise of the new Communist Party — and its charismatic leaders. Communism, a political movement born from resistance to the spread of global capitalism, the rise of colonialism and the negative effects of the Industrial Revolution, swept the globe in the 20th century. At its height in 1985, communism held power over nearly 38 percent of the world’s population. Despite the movement’s reign over 24 countries, the communist party in one country was often quite different from the party in another. 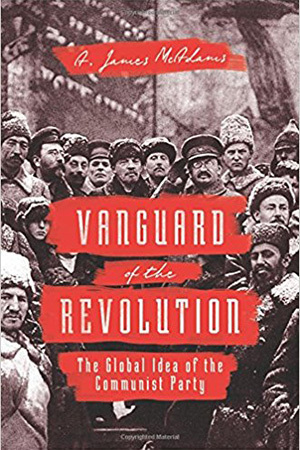 In “Vanguard of the Revolution: The Global Idea of the Communist Party” (Princeton University Press, 2017), author A. James McAdams, the William M. Scholl Professor of International Affairs and director of the Nanovic Institute for European Studies at the University of Notre Dame, seeks to understand how such a significant institution could be so different from country to country and still flourish. To find the answer, McAdams traveled to every location with a history of communism to research this book, including China, Cuba, Vietnam, North Korea and the former Soviet Union. Each country has its own story about how communism came to power, usually driven by larger-than-life characters such as Joseph Stalin, Mao Zedong and Fidel Castro. For more information about “Vanguard of the Revolution,” visit https://press.princeton.edu/titles/11095.html. Originally published by Brittany Collins Kaufman at news.nd.edu on November 13, 2017.